Charles Edward Anderson "Chuck" Berry (born October 18, 1926) is an American guitarist, singer, and songwriter, and one of the pioneers of rock and roll music. With songs such as "Maybellene" (1955), "Roll Over Beethoven" (1956), "Rock and Roll Music" (1957) and "Johnny B. Goode" (1958), Chuck Berry refined and developed rhythm and blues into the major elements that made rock and roll distinctive, with lyrics focusing on teen life and consumerism and utilizing guitar solos and showmanship that would be a major influence on subsequent rock music. Born into a middle class family in St. Louis, Missouri, Berry had an interest in music from an early age and gave his first public performance at Sumner High School. While still a high school student he served a prison sentence for armed robbery between 1944 and 1947. On his release, Berry settled into married life and worked at an automobile assembly plant. By early 1953, influenced by the guitar riffs and showmanship techniques of blues player T-Bone Walker, he was performing in the evenings with the Johnnie Johnson Trio. His break came when he traveled to Chicago in May 1955, and met Muddy Waters, who suggested he contact Leonard Chess of Chess Records. With Chess he recorded "Maybellene"—Berry's adaptation of the country song "Ida Red"—which sold over a million copies, reaching #1 on Billboard's Rhythm and Blues chart. By the end of the 1950s, Berry was an established star with several hit records and film appearances to his name as well as a lucrative touring career. He had also established his own St. Louis-based nightclub, called Berry's Club Bandstand. But in January 1962, Berry was sentenced to three years in prison for offenses under the Mann Act—he had transported a 14-year-old girl across state lines. After his release in 1963, Berry had several more hits, including "No Particular Place To Go", "You Never Can Tell", and "Nadine", but these did not achieve the same success, or lasting impact, of his 1950s songs, and by the 1970s he was more in demand as a nostalgic live performer, playing his past hits with local backup bands of variable quality. His insistence on being paid cash led to a jail sentence in 1979—four months and community service for tax evasion. Berry was among the first musicians to be inducted into the Rock and Roll Hall of Fame on its opening in 1986, with the comment that he "laid the groundwork for not only a rock and roll sound but a rock and roll stance." Berry is included in several Rolling Stone "Greatest of All Time" lists, including being ranked fifth on their 2004 list of the 100 Greatest Artists of All Time. The Rock and Roll Hall of Fame's 500 Songs that Shaped Rock and Roll included three of Chuck Berry's songs: "Johnny B. Goode", "Maybellene", and "Rock and Roll Music". Today – at the age of 85 – Berry continues to play live. Foundational text courtesy of Wikipedia. 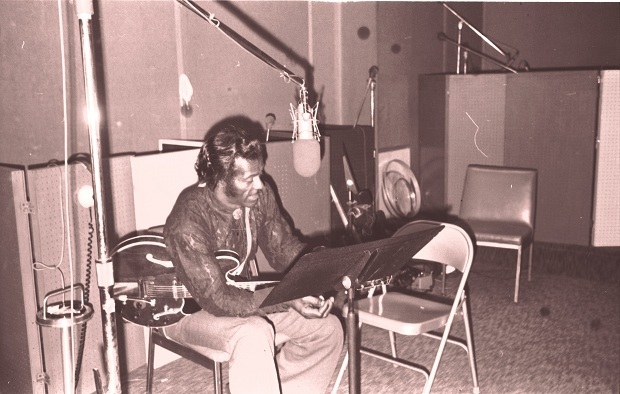 Below photos are from a Chuck Berry Session, at Sound Exchange Studios, NYC, circa early-mid 1970's. Photos courtesy of Chris and Phyllis Juried. 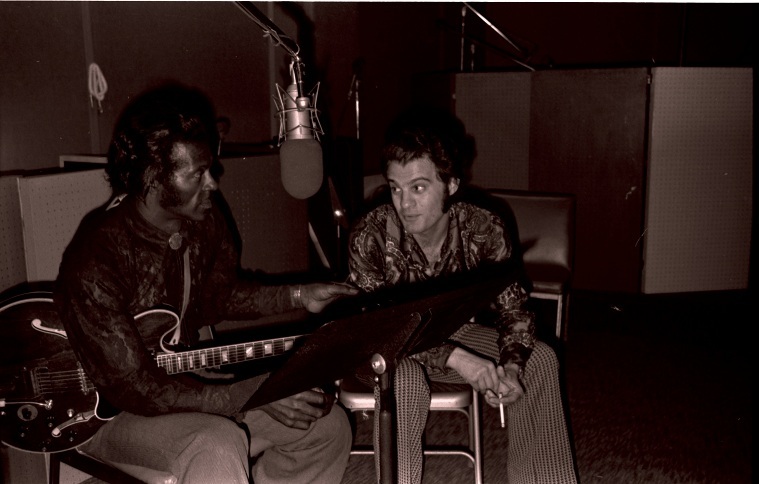 Write about Chuck Berry Recording Sessions! 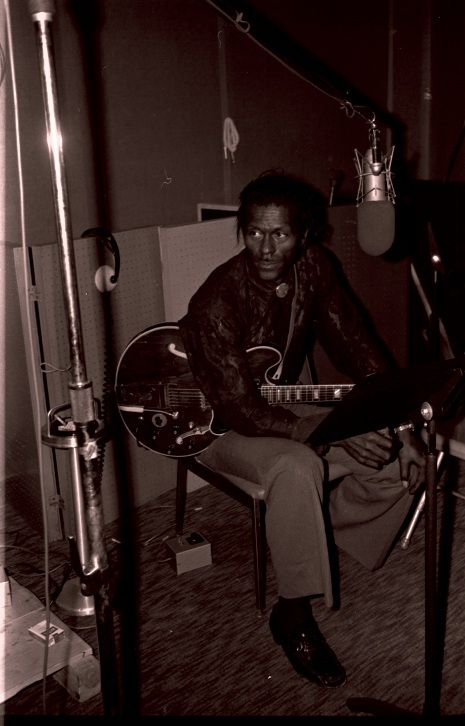 Do you have content or pictures, to add, of Chuck Berry Recording Sessions? Please feel free to Share it, here! What other Visitors have said about Chuck Berry Recording Sessions!